Hello and welcome. Here at Doorstep Dishes you’ll find recipes and stories told by us – two friends who’ve cooked their way through a lot of life’s ups and downs. We’ve created a plate to pass or a pitcher to pour for everything from birthdays to block parties, housewarmings to hurricanes, for a friend in need or a new parent in those first foggy days after the baby arrives. We’re all about jumping into whatever life brings and pulling people together with great food. We realize that giving and receiving awesome homemade food is nothing new, but we’re starting a new, real life conversation about this time-tested tradition. So check us out and join in – be part of our community. On our Recipes page you’ll find the perfect match for many occasions, ideas that we came up with after fruitless searches for just the right dish to make and bring. In a section called Giving Traditions, we explore customs and rituals associated with giving food to friends at different times in their lives. 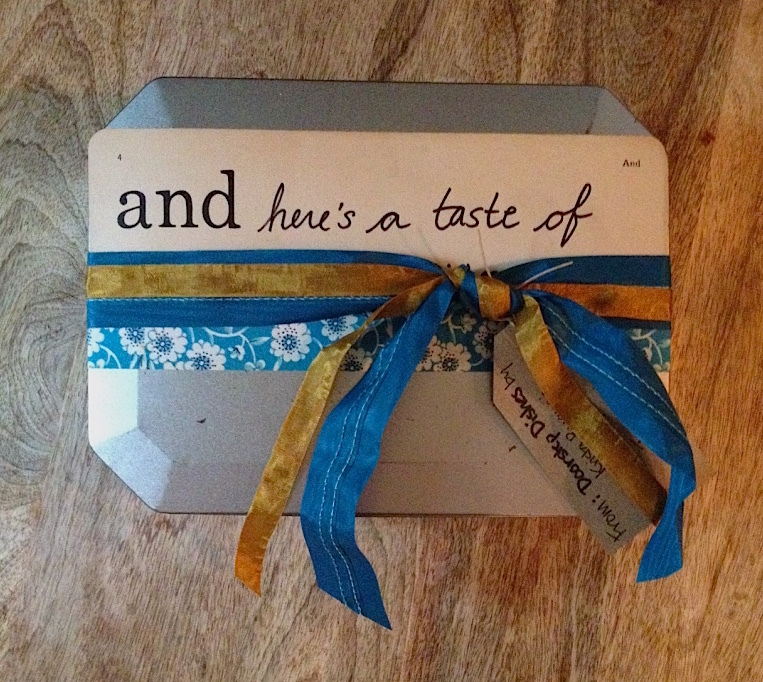 The Get Crafty section shows creative ways to package food by tapping into DIY sensibilities. We love all things vintage and believe that something doesn’t have to be expensive or complicated to be beautiful. So look around, get inspired, bookmark and come back often. We have plenty to share and know you do too. The weather turned from iffy to glorious this weekend and with it re-emerged the Impromptu Backyard Gathering (or Deck Potlucks). In our little hamlet, the hum came back to the street as neighbors met on front lawns to discuss whose grill was ready to fire up to make an eclectic communal meal. (It wasn’t mine, it’s still housing spiders and covered in cobwebs in the garage). We were all engaged in our busy spring afternoons – parents rushing kids off to soccer, others turning over the dirt in their gardens readying beds for spring planting, some less glamorously cleaning out the garage or pumping up flat bike tires – when a fabulous neighbor volunteered her deck and grill. In all fairness, there was no real time to plan ahead and shop for a well-considered dish to bring, so we all had to see what we could pull together to contribute. Sound familiar? This situation (happily) happens in our town pretty frequently when the weather warms up. And we’ve learned it’s not a time to panic. This is when we look deep into our pantries and fridges to see what we can pull off on the fly. A can of this, a morsel of that, we look for the key-player ingredients that will rise to the occasion. Things like citrus, briny olives or anchovies that are full of flavor, staples like beans and spices and neutral starches like quinoa, rice and couscous and versatile veggies like lettuce or zucchini can be the building blocks of something good. Coincidentally or not, Stacy and I were both invited to impromptu potlucks on our respective streets this past weekend. And we both found treasures on our shelves to pull off surprisingly delicious and EASY post-hibernation salads. These are simple, versatile and forgiving recipes. And we nearly always have ingredients for at least one of them on hand. 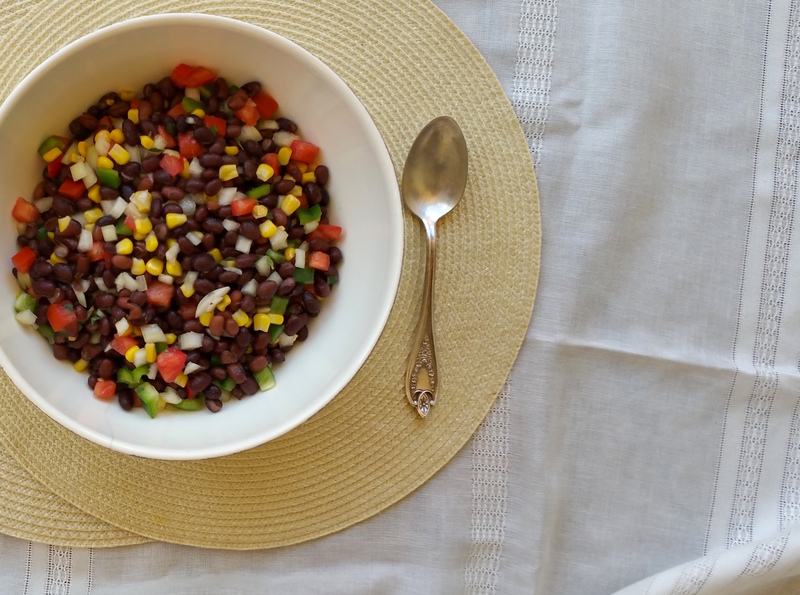 This is a staple, made with hearty black beans and vegetables you’ve probably got hanging around like bell peppers, tomatoes, onions and corn (frozen is fine). 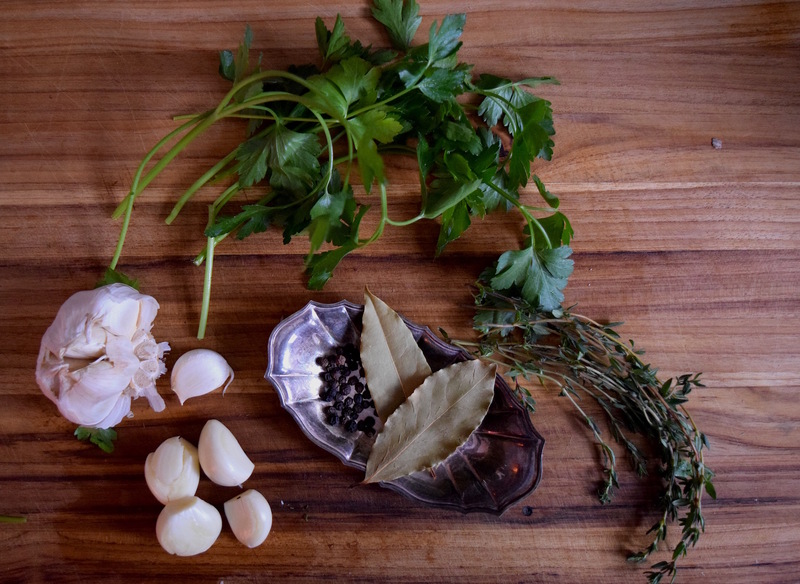 Use some or all and add fresh herbs, if you have them. Dressed with citrus, olive oil, and seasoned well, it’s ridiculously tasty in it’s basic simplicity. The key to this salad is to cut all the ingredients about the same size as the beans so you can taste everything one bite. The proportions are forgiving so you don't have to be exact and you can add or substitute veg however you want. Go with what you think tastes good. Stick a spoon in it and walk across the street to the party. This one is a play on one of our favorite combos: olives and oranges. A nod to Spain, or to Morocco, even Sicily. It’s a combination that is at once salty and briny, yet sweet and rounded from the orange. 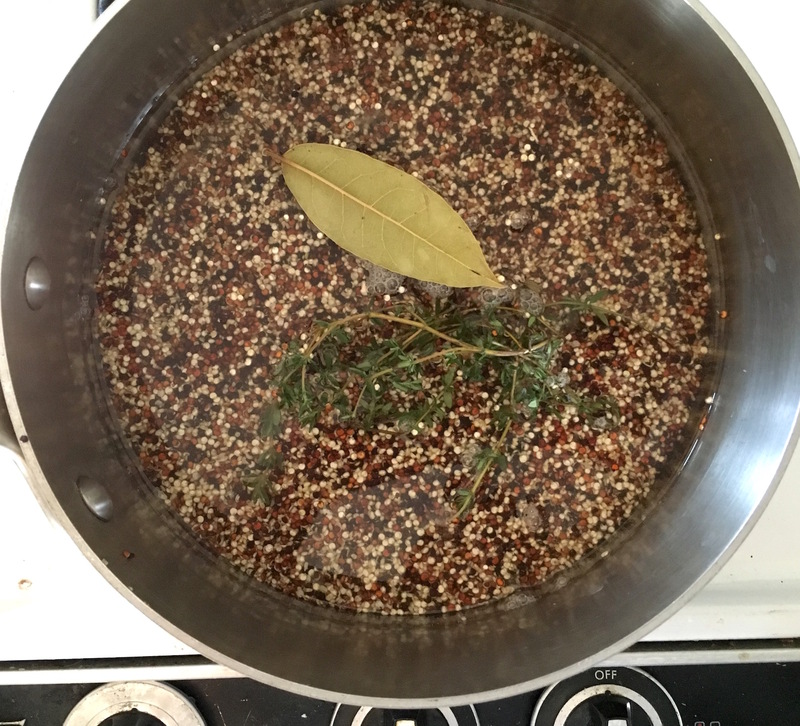 We like to cook our quinoa with aromatic bay leaf and fresh thyme (if we’ve got it) to build in a little more flavor. Another shortcut is to stir in the chopped shallot and olive oil while the quinoa is still hot. It will steam a little and infuse it’s flavor throughout without having to sauté the shallot – a timesaver – ’cause you’re in a hurry here! Finally the last tip is to use both the orange juice and the zest. They compliment each other and bring out the true flavor of the orange. 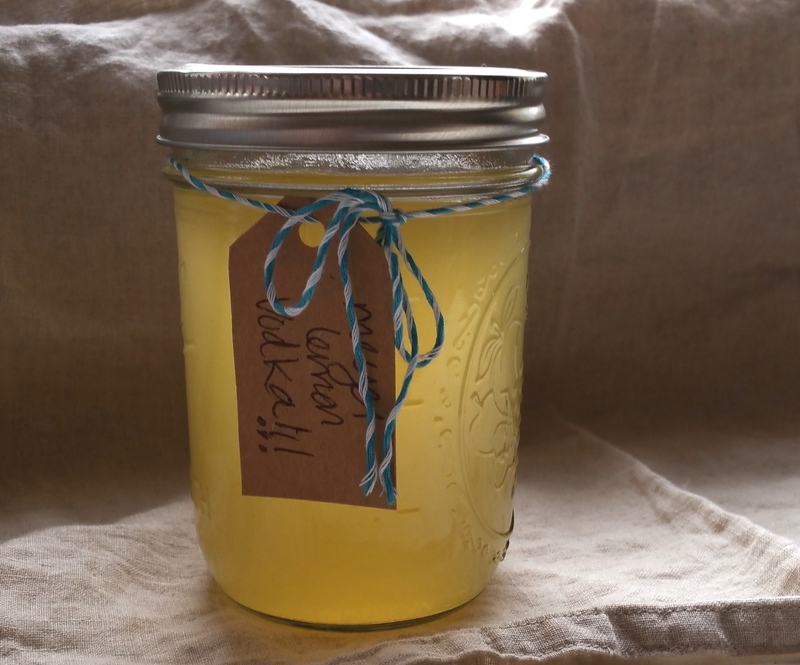 Make this and you’ll hear rave reviews. 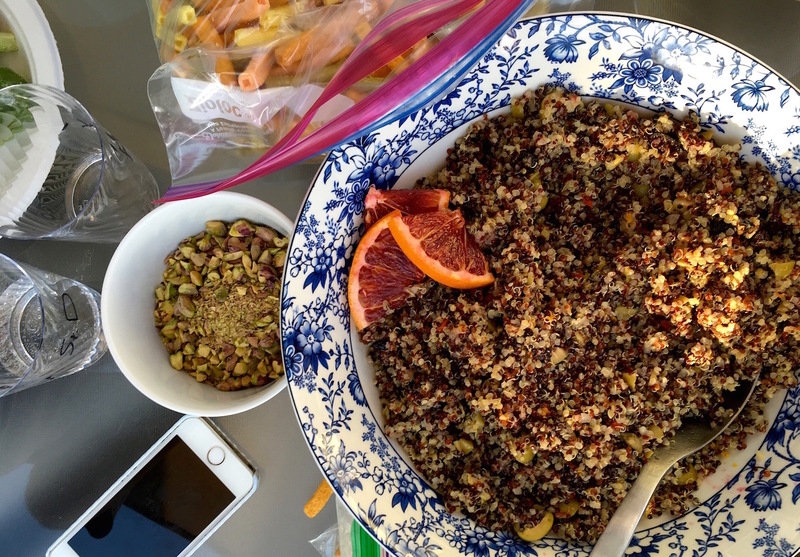 We used multicolored quinoa, cara cara oranges and green olives stuffed with pimiento along with black oil-cured because that's what we had on hand. (Yes, we're a little fancy.) Any kind will work so use whatever you have and spend more time out socializing face-to-face with friends. 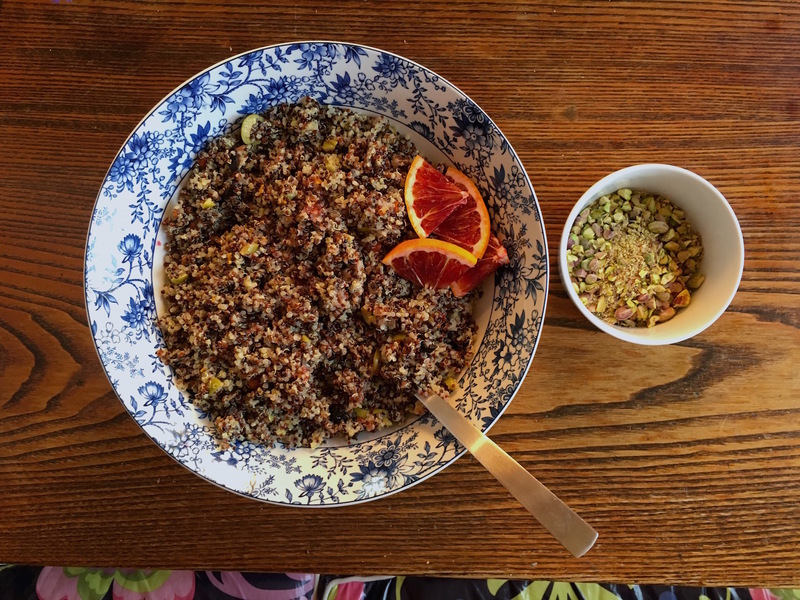 Stir shallot and olive oil into quinoa while it's still steaming in the pot. Toss with everything else in a large bowl. Add a spoon and take it to your friend's house. 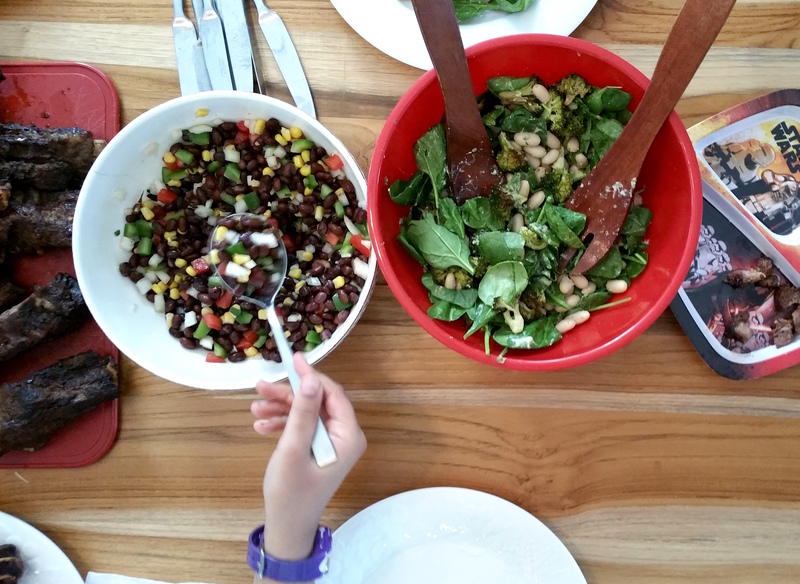 Our black bean salad next to a spinach salad with cannellini beans (above) and ribs pulled right off the grill (yay!). 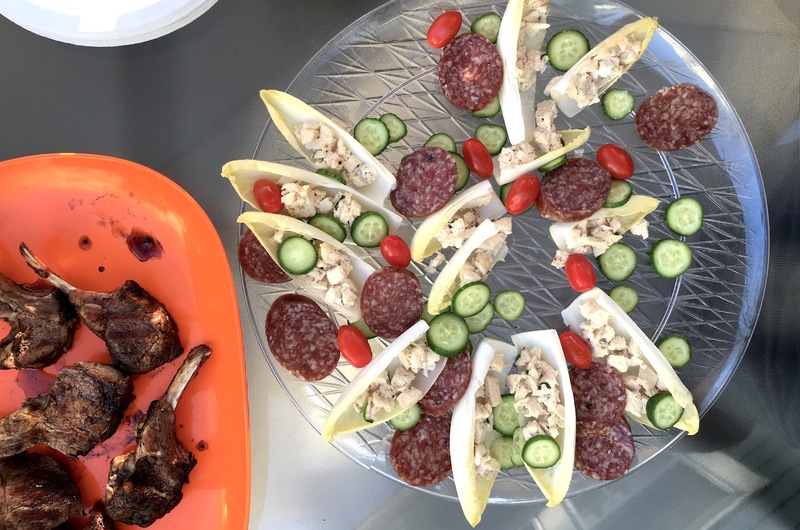 Below, some finger food – chicken salad stuffed in endive (brilliant!) with a plate of grilled lamb chops (yum!). Well hello there spring. Just like everyone else who visits Hollywood, I took a bunch of pix. One shows a big, warm hug with a friend I hadn’t seen face-to-face since the 90s, taken by a stranger in front of my hotel. We look happy and cool in our leather jackets, kind of like we did back then. So I posted it up on Facebook. Another friend from that era, an old roommate, commented and the very next day we caught up over a bowl of steaming ramen. It was as if no time had passed, and for the rest of the weekend, I felt all warm inside. Sometimes the electric over-sharing we are all guilty of actually means something. These reunions happened because I was in Los Angeles for the IACP conference. It’s a long weekend of learning (and eating) full of (always-hungry) food writers, cooking teachers and policy makers. Intensely immersive, it’s an exhausting but incredible experience. Krista was there to hustle for her day job and I went to rep Doorstep Dishes. Mostly, we went to connect with people who do what we do in person. While living online is fun, there’s still no substitute for meeting someone in the real world. Back in the 90s, I was working nights to pay for school and a flat I shared in a San Francisco neighborhood none of us can afford now. My roommate Matt Dickson was an artist by day and a cook at night. He stuck with the job that paid, putting in the hours at the stove until he had what it takes to be a boss. And then a consultant. After working on countless concepts for others, he’s opened a place of his own. It’s a low-key, breakfast and lunch place called Division 3 in LA’s Glassell Park. Every day, he rolls out buttery biscuits and stuffs them with house-cured corned beef or salmon, chorizo, ripe avocado, a special sauce, a just-right runny egg. His biscuit sandwiches are $4, not huge but filled with the familiar, comforting flavors of the morning. The day after we met up, Matt brought over a bagful and Krista and I tore into them like sharks. It was the ultimate Doorstep Dish. Division 3 biscuit sandwich love. As food writers, we do our best to convey the feeling behind what we cook, but much of our work exists only when someone logs in and looks at it. The reality is that for-fun reading is a quiet, solitary experience, something done over a quick desk lunch. Doorstep Dishes is all about bringing people together so we struggle with this contradiction. Our stories are genuine, but there’s no substitute for the look on someone’s face when you hand them a plate of still-warm brownies you made just for them. An article is not the same as dipping your finger into a pot of soup, to make sure it’s perfect, before walking it across the street to your friend who caught the flu. Or even skipping the lonely lunch and asking a coworker to join you at a spot around the corner. These things are so much more meaningful than anything experienced online. We hope our stories inspire you to shut it all down once in a while and go spend time with someone over real food in a real way. In LA, we shared a few killer meals at buzzy restaurants, but it’s the people we met that I think about most. One Saturday lunch will stay with me for a while. 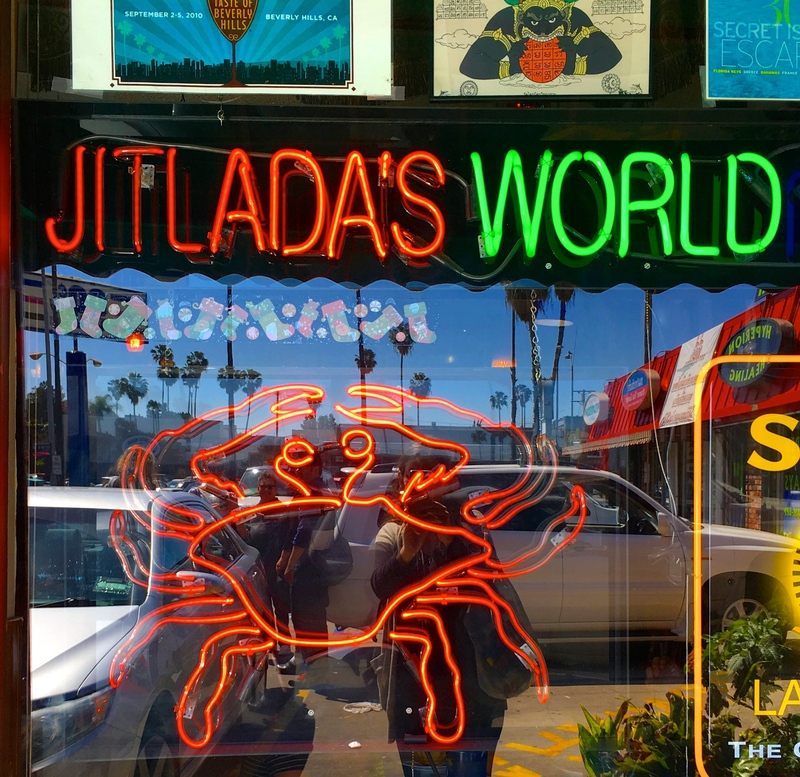 Irvin Lin, who knows his way around LA and a layer cake (he runs Eat the Love), brought a bunch of us to Jitlada in Thai Town. Seven of us passed bowls of velvety lamb curry, lightly battered morning glories, and platters of Pacific Rim seafood too plentiful to list. It was an outrageous feast made even better by the company. I sat next to Amanda Feifer who wrote ‘Ferment Your Vegetables’ and had the sense to stop eating before she was uncomfortable (something I aspire to.) We also met Shauna James Ahern, the venerable Gluten-Free Girl who’s created four cookbooks, a custom blend of flour, and won a James Beard Award. A true inspiration, she shared deep knowledge gained from being one of the first to write about food online 10 years ago. Sean Timberlake who runs Punk Domestics, my DIY urban homesteader go-to site for years, held down the other end of the table along with Nicky Sizemore. Turns out author and teacher Nicki knows an old neighbor of mine in the small upstate NY town where they both now live, continuing to shrink the planet and loop us all together. By the end of the meal we were finishing each other’s sentences (and desserts). The dishes outnumbered the people at Jitlada. 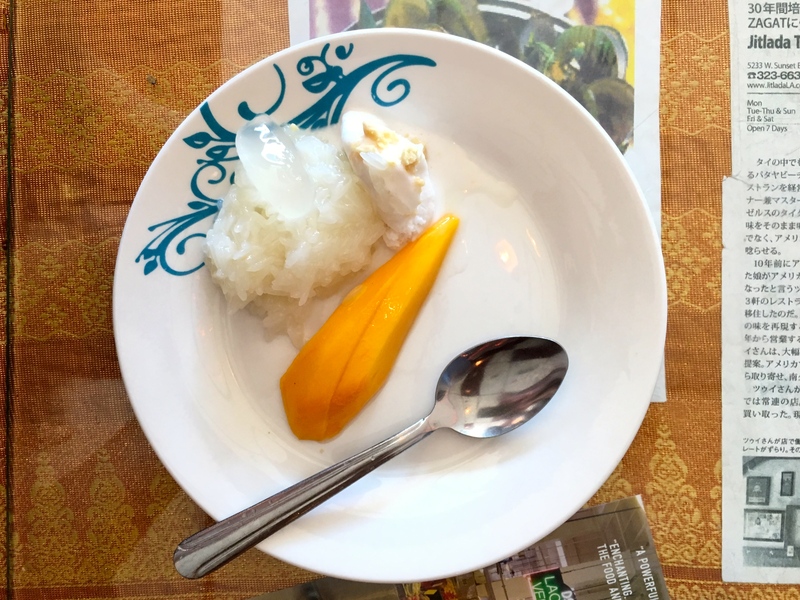 Dessert below – sweet sticky rice, gelée, ice cream, mango. A few days later, I was on the plane, relaxing and reflecting, I felt lucky. Damn lucky. Not everyone can ditch their family and fly to the other side of the country to think about nothing but food. Sure, I’m a professional cook and writer (and a wannabe food photographer), so it’s my job, right? Yes and no. I’m also a teacher, a mom, a neighbor, a gardener, a library volunteer, a person who can’t go by a garage sale without stopping (whatever they call that). These are my other jobs, my tribes, the circles that overlap and define who I am. And while it sounds like something begging to be a Venn diagram (ah, PowerPoint) it’s more complicated than that. These circles aren’t just mine. They don’t even exist without everyone else who’s in them – friends, family, coworkers, people from my past, present, future. Every single one of them makes life what it is, for better or worse. And I am honored when one of them wants to spend time with me cooking, talking or sharing a meal, especially if it happens 20 years and a lifetime after our last meet-up. Matt and I didn’t take a picture together in LA. Maybe we forgot or maybe it was the punk spirit bubbling up from the olden days. We’ll see each other online and probably comment and ‘like’ a little more often than before, but it’s our lunch I’ll keep thinking about. And those biscuits that I’ll dream about until I can get out there and stuff one in my face again. No recipe this week, just stories and way too many pix of LA’s rich food scene. What tribes are you a part of? That’s us – stoked to be in LA. We like to break the rules, but knowing when it’s the right thing to do and when it’s not is key. A few generations ago, you would never arrive on the doorstep of a friend’s brunch or dinner party without a thoughtful gift in hand. Things are different now. 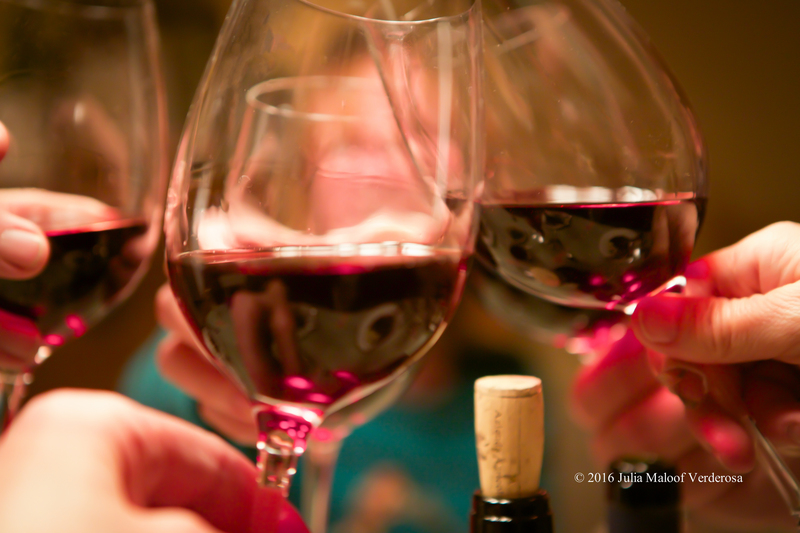 Today, it’s fine to lean on a decent bottle of wine or a bouquet picked up on your way there to say thank you. These nice gestures are always appreciated, but since everyone does the same thing, they’re not very special. Enter the homemade hostess gift. The term may seem dated and a bit sexist, but thanking someone who’s cooked for you is absolutely of-the-moment. Nurturing friendships and being polite never go out of style, so make it meaningful by giving some of what really matters – your time. (After all, it’s not really the thought that counts, it’s the follow-through.) Plan ahead and make one of our quick pickles. Cured overnight in the fridge, they’re crunchy, fresh and fun, and much easier than you’d think. And they never disappoint. What’s great about pickles is that they don’t have to be fancy to be impressive. Neatly stacked in a jar, they look way more complicated than they are so you immediately get extra credit. It’s actually a pretty simple process. 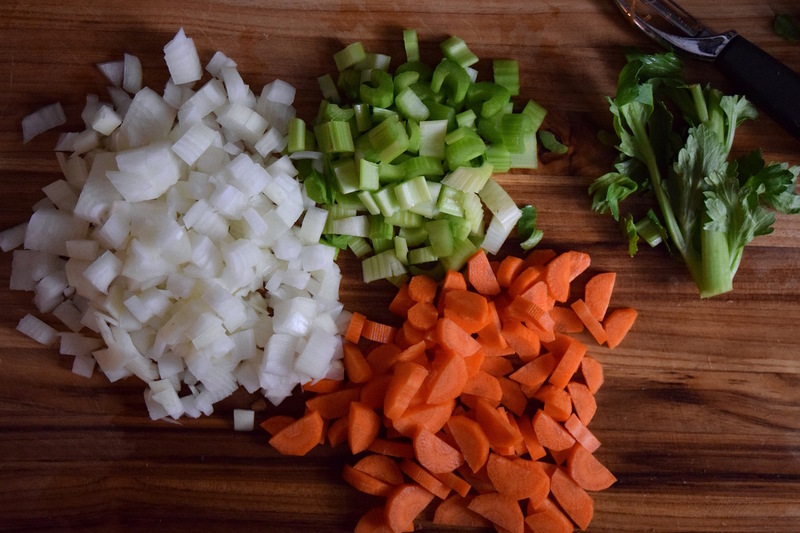 Slice fresh veg, layer with herbs, spices and salt, bathe in vinegar and refrigerate. Let them sit while you sleep and wake up to jar of versatile deliciousness. Bring them to brunch to garnish a pitcher of homemade Bloody Marys or put them out with bread and charcuterie to start things off. Better yet, eat them with your fingers standing in front of the fridge with the door wide open. They truly work for any occasion. If you choose to bring them as a gift for your host, here’s the general etiquette: while you may want to dive right in, it’s best to let her – or him – decide whether to share or to stash them for later. Don’t worry. Your pickles will be enjoyed no matter who, when or how they get eaten. Here are three variations – we just couldn’t decide which was best so we bring them all. And why not. It’s finally spring and everyone’s starting to come out of hibernation and hang out more. Make a double, triple or even quadruple batch and keep some on hand for the impromptu stoop parties that are about to start happening. Pickles are all about presentation so choose what will look best peeking through the glass. Cutting counts here too so sharpen your knives and take the time to get it right. This recipe makes enough for one pint so scale up accordingly. 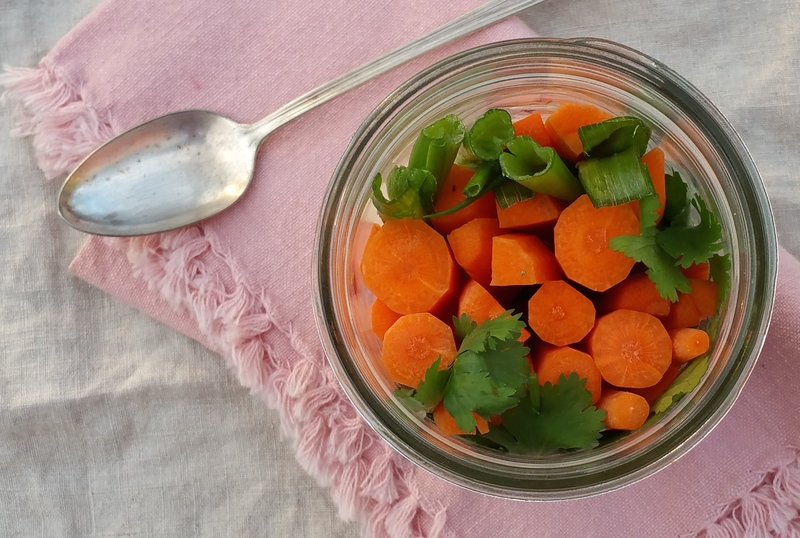 Place dried spices in bottom of jar and arrange vegetables so that they lean against cilantro and show off. Carefully pour in vinegar leaving ½” of headspace. Tap jar on table or run a chopstick around the edge to release trapped air bubbles. Tighten lid and place in fridge overnight or longer (flavor deepens the longer they sit). Taste the brine to make sure it’s where you want it. 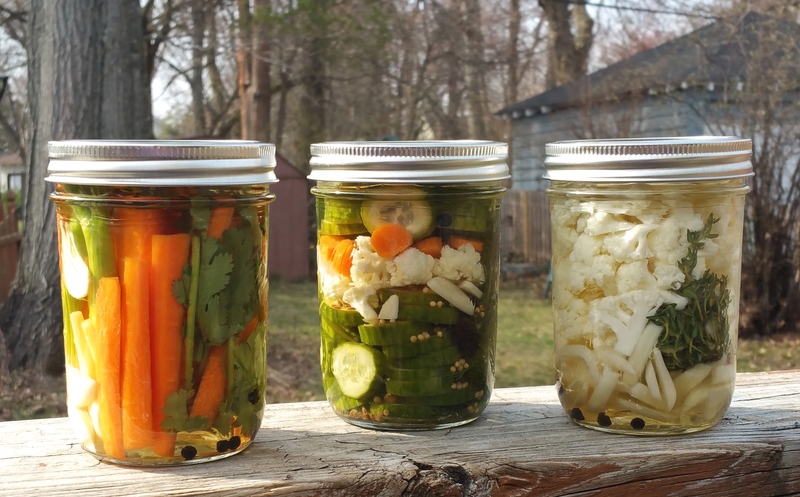 If you need vegetables to pickle faster, dial the vinegar up or cut the veg in smaller pieces. Bring vinegar, water, sugar and salt to a boil in a small saucepan. Remove from heat and set aside. Spread a layer of cucumbers on top of spices, cauliflower next, then garlic, carrots and back to cucumbers. Order doesn't matter, do what you think looks best. Pour brine over vegetables leaving ½” headspace. Tap jar on table or run a chopstick around the edge to release air bubbles. Measure dried spices into bottom of jar followed by garlic. Place thyme in jar so stems rise up the side. Add onions and then cauliflower using them to hold thyme in place and look gorgeous. Bring vinegar, water, sugar and salt to a boil in a small saucepan and remove from heat once everything has melted. Wrapping doesn’t have to be expensive or perfect to be beautiful. 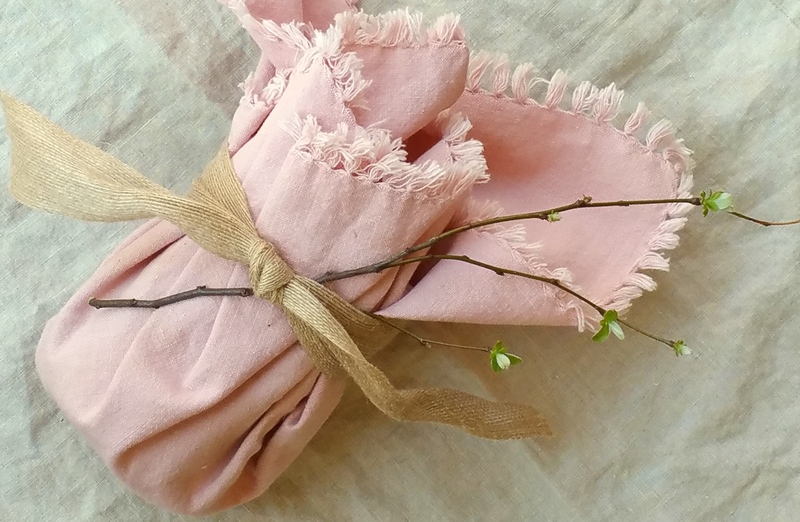 We keep it casual with a soft linen napkin and some budding twigs from the garden. Use this look as an excuse to start a napkin collection in the back of a drawer and as a reason to stop at spring-cleaning garage sales as they pop up in your neighborhood. The season is full of possibilities. ‘Not much’ is what I find myself saying when I run into friends who ask what’s going on. It’s an automatic response, but it’s true. I’m a chef-mom and the leader of my little family, but life is pretty simple. My girls are school-aged so we live in the rhythm of the academic year. By now, our school-work-whatever routine rolls along and everyone does what they’re supposed to do. Well, for the most part. There’s still some early morning footwear drama, but no Oscar nominations. Stalling and massive waves of eyerolls, yes, but apparently that’s ‘age-appropriate behavior’ even if it is irritating as hell. We make it before the final bell so all’s good. Without revealing enough to jinx it, let’s just say we are solidly in the groove. And that I consider a total victory. Sometimes it’s nice to celebrate the triumphs of an ordinary day. 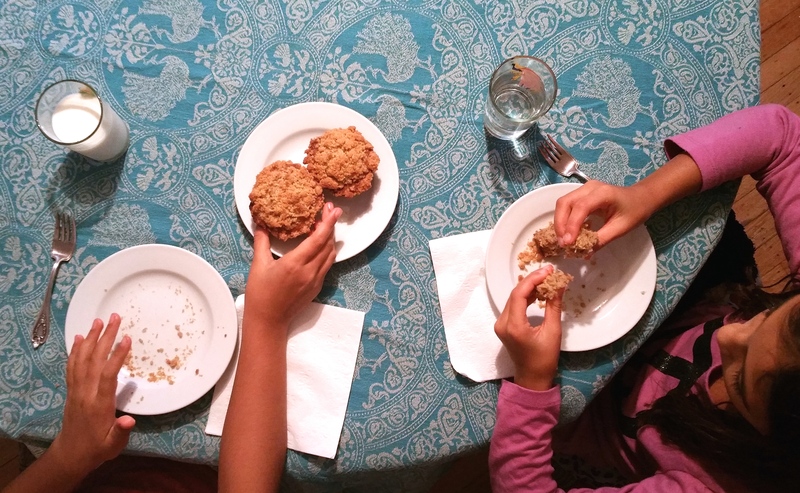 We have a family rule about not eating sweets during the week, but knowing how to break the rules is a life skill too. So I surprised everyone with a sugary gift on a Wednesday afternoon – just because. My kids were shocked and it made them happy (and all that eyerolling stopped for a few). Plus I needed to use the black bananas that had been sitting on the counter begging for attention, so why not? This recipe makes just enough for a tray of muffins or a small weeknight cake. It isn’t beautiful or fancy, but the coconut crunch on top is something special. Make sure you pinch a little taste before it goes in the oven. It’s almost as good raw as it is baked. This recipe looks complicated because there are two parts, but it’s not. We top off with a crumble instead of frosting because it’s easier to pull off midweek and takes 10 minutes max. It makes one 8” x 8” cake or 15 muffins, and easily doubles for a 9” x 13” cake. Or make two small ones and wrap one up for a friend who needs a reason to smile. Just because. 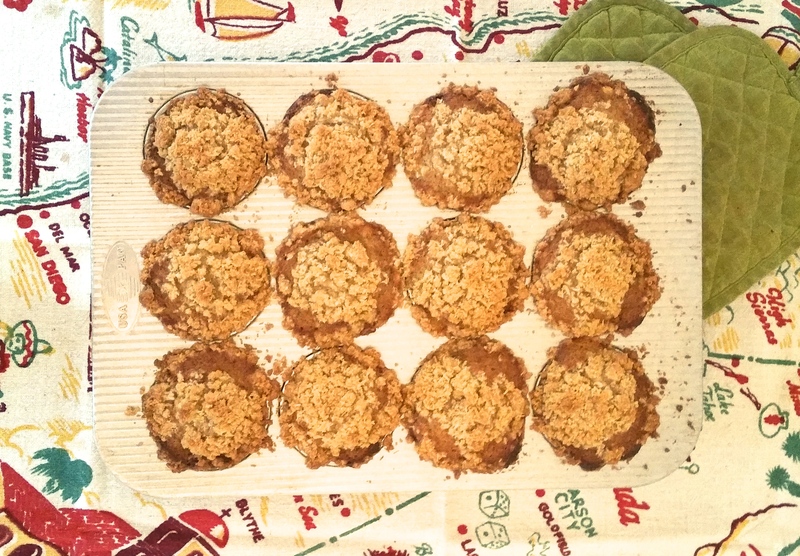 We came up with this topping for the Banana Coconut Crumb Cake but it works on other muffins, pies or cakes. It also bakes up nicely on it's own as something to top off ice cream. Place everything in a bowl and rub and mix it together with your fingertips until you can pinch it into small clumps. Set aside and make the cake. This cake is fine on its own, but it begs for our Coconut Crumb Topping or a cinnamon cream cheese icing. The recipe makes one small cake or a tray of muffins. Double it for a big cake or make two and give one to a friend who needs a reason to smile. Sift together flour, baking soda and salt in a medium bowl. Set aside. Place bananas, granulated sugar, dark brown sugar, eggs, coconut oil, yogurt and vanilla in the bowl of a stand mixer. With the paddle attachment, blend at medium speed until smooth for the most part, about 2 minutes. There may still be a few lumps of banana, but they should all be smaller than a pea. Mix dry ingredients into wet, scraping down the sides and mixing just until blended. Batter may still be a little lumpy. Pour batter into greased or non-stick pan and spread evenly with a spatula. Sprinkle Coconut Crumb Topping evenly over the top. Bake until a toothpick or cake tester comes out clean from the middle, about 45-50 minutes for an 8” x 8” cake and 20-25 minutes for cupcakes. 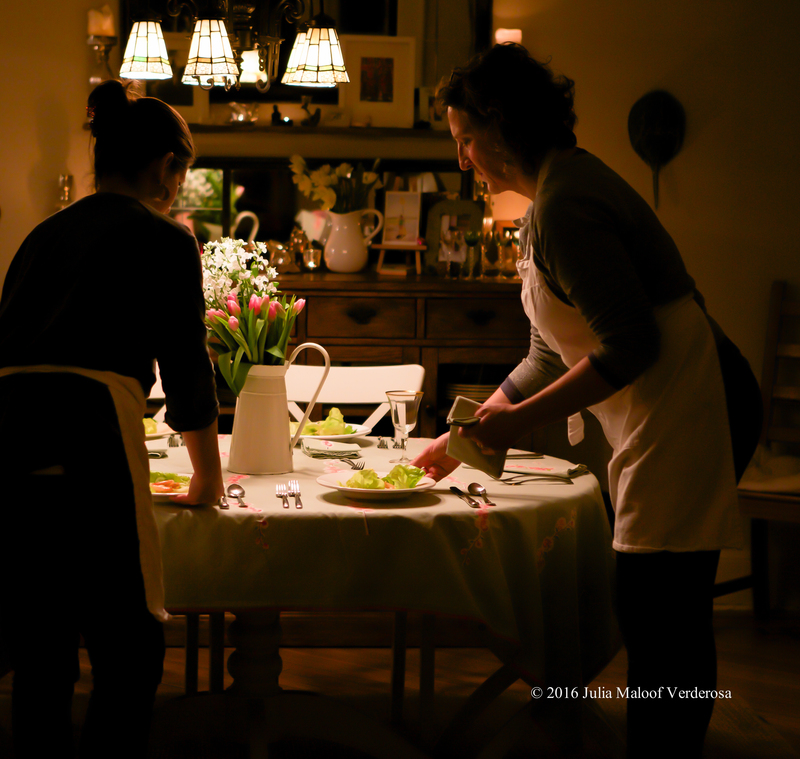 Would You Trade A Dinner Party for Some Photography? Bartering. When you possess a skill that is useful, like carpentry, or accounting, or cooking or web design or photography or a whole host of other uniquely acquired skills, bartering can be a great way to trade services without spending too much money. We had such a need when building this site. We needed head shots and fast, and we needed someone who knew us well to take them (we’re not actresses). Our schedule was tight, self-imposed deadlines loomed and our seasonal summer posts were aging in our drafts folder. We were eager to go live with Doorstepdishes.com, but without head shots it just felt unfinished. And without spending a ton of money, it seemed impossible. So we looked to barter. We reached out to a friend, neighbor and talented portrait photographer, Julia Maloof Verderosa, (you can check out her site here) and offered her a trade: a dinner party for a day of head shots. As a professional, we recognize her time is valuable. The job wasn’t the simplest ask, it included a day of planning the shoot, the shoot itself and time spent editing and color correcting. And for us, it was really the cost of the proteins and a few vegetables (most staples we already had) and our time spent cooking together. What we got in return, weren’t only the solidly gorgeous photos of us on our bio page (check it here), but a closer friendship and loads of inside jokes (the hilarity that ensued – if you only knew). It was also a moment of entrepreneurial empowerment among women. 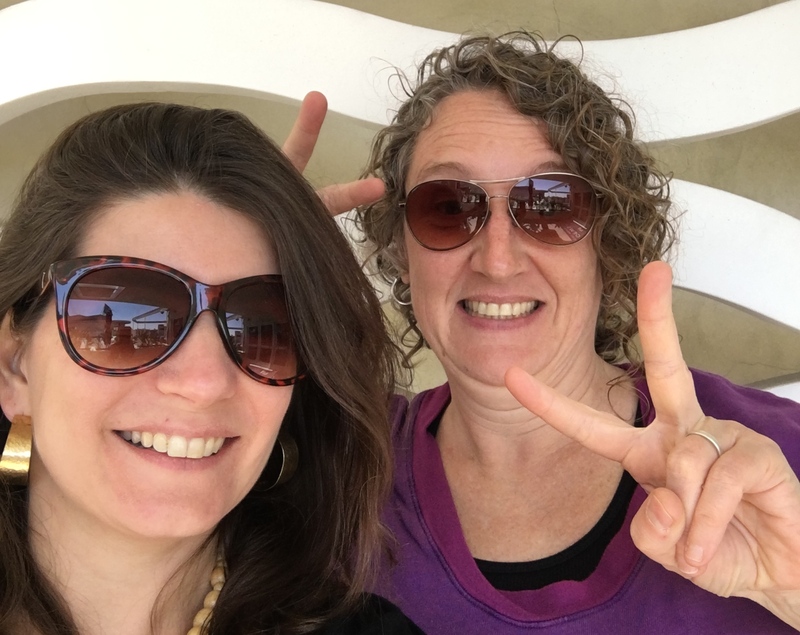 We felt like we were channeling women of another era getting things done with pure talent and skill – or conversely were breaking out our righteous punk rock spirits for bucking the system a little. 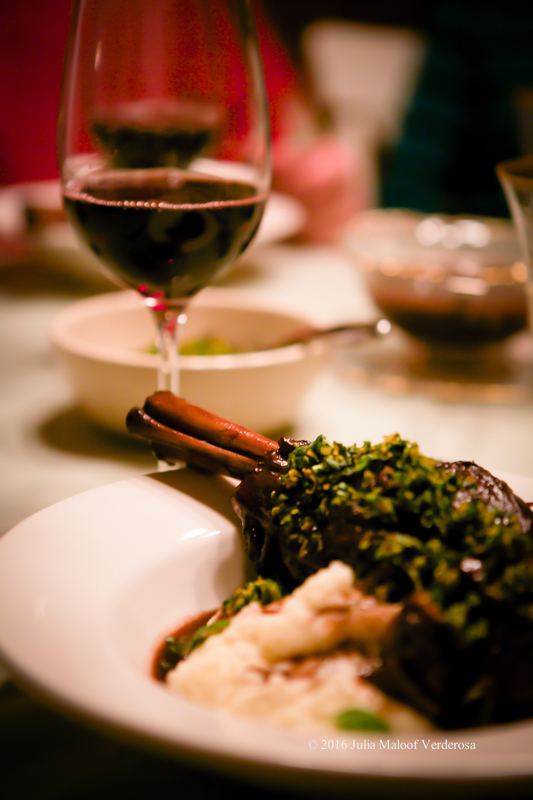 Lamb shanks braised in red wine and warm spices with orange-mint gremolata. And in the end – it was more than we bargained for. We were reminded why we were drawn to the food biz all those years ago – that cooking for people was still so much fun. 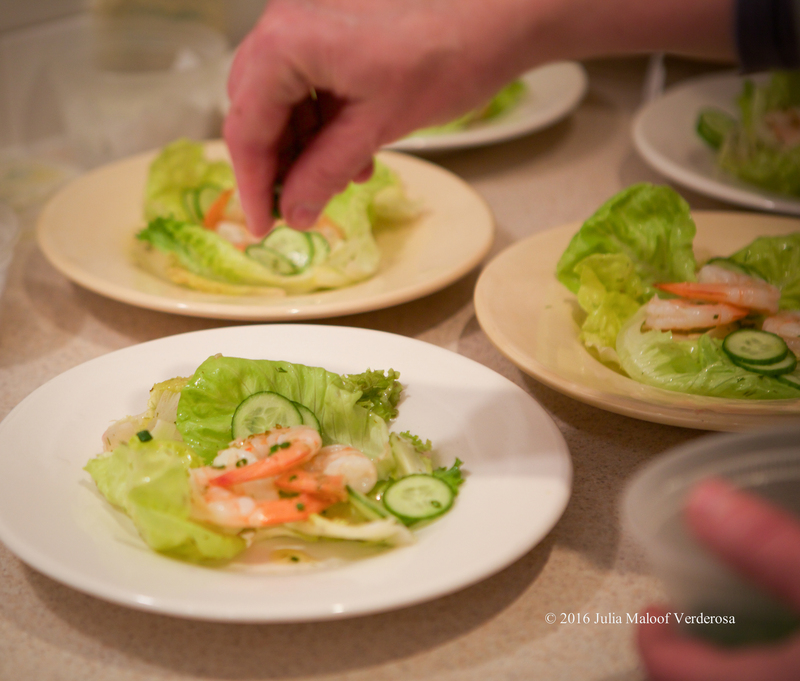 It was ultimately so satisfying to craft and make incredible tasting food, feed a group of people and allow them to connect through the act of eating a meal. And how cool was it that we could share that with someone else and give our friend that moment? And as we joined Julia for champagne and then limoncello at the end of the night, we knew we’d dug deeper into a solid connection. And isn’t that what it’s all about? We all get the call. There’s someone we know who’s going through a massive rough spell. Be it an illness, or death in the family. Work deadlines galore, issues with the kids, or a general malaise of existence. These might be friends we know well, the ones who text us from the doctor’s office or their commute home. Or it could be a more distant, yet heartbreaking school-wide email, that brings you to tears as you learn the news of a serious hardship affecting someone you don’t know, but who is part of your community and still might need your help. These are the days when, if you can make the time, the gift of really good-for-you food becomes more than empathy. It relieves the burden of the grind and becomes a momentary pause from the pain, the grief, the worry. It becomes more than sustenance. It nourishes. 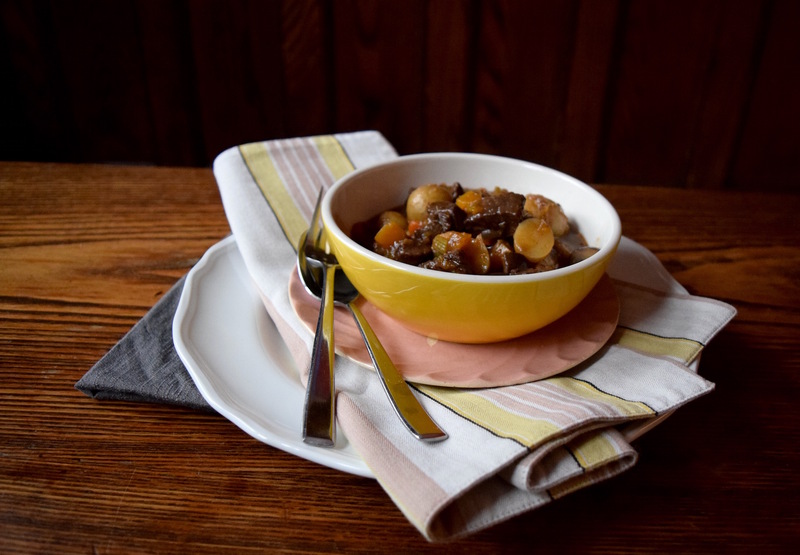 If the weather outside is blustery, and the nighttime temps drop below 50 degrees, this beef stew is the recipe that is the right one to bring* (*provided the family is not vegetarian…for that see our beet salad or a future vegetarian post – we promise!). 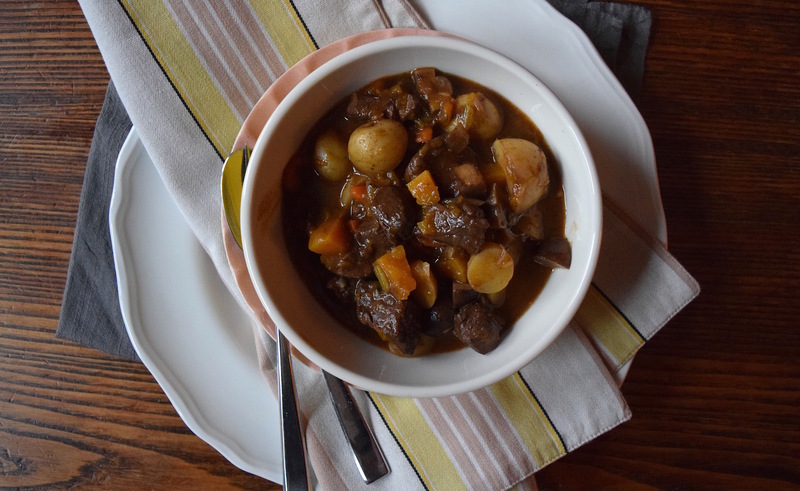 Beef stew is hearty and comforting. It can be extended with noodles, served at once for the whole family or microwaved in small bowls for lunches. And it freezes. It freezes so well that you might even consider gifting it frozen, in case the family is already inundated with food. And we have found that even the pickiest of eaters from small to large, like beef stew – a lot. This one is rich with vegetables for added flavor and nutrients including the optional butternut squash which lends a little sweetness and color. Braised in red wine and garnished with small potatoes, diced squash and mushrooms. It’s thickened with arrowroot, but you could just as easily use cornstarch or a beurre manié. 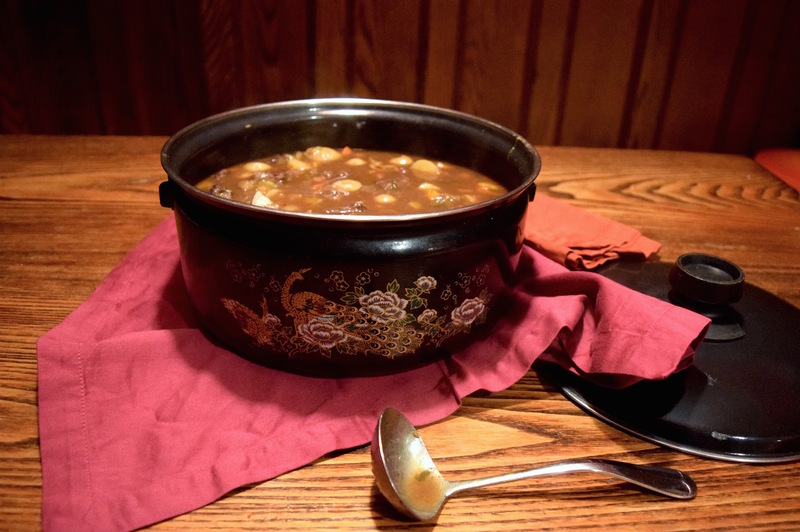 Rich and hearty beef stew made with simple ingredients. Generously season the beef cubes on all sides with salt and pepper. Preheat a 6-quart Dutch oven over medium high heat then add the oil. 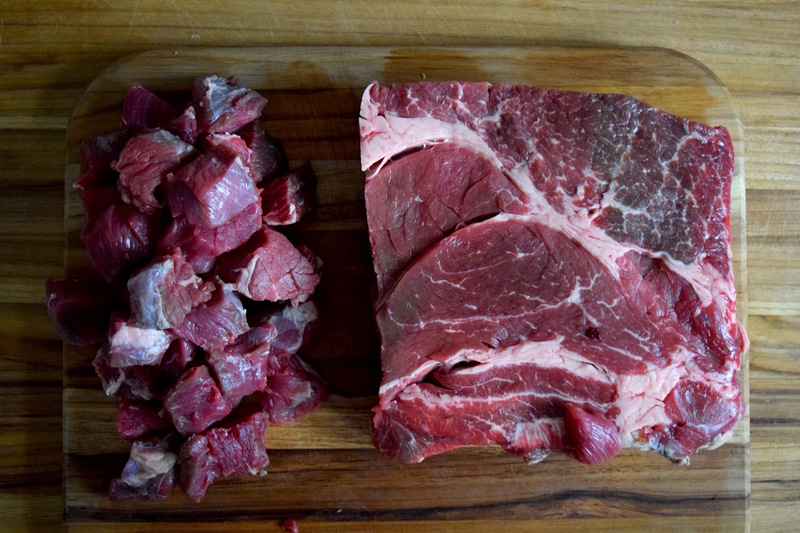 When it shimmers, add about ⅓ of the beef cubes in one layer to the bottom of the pot. Space out the beef so they sear and don't steam. (Steaming happens when they are nestled too closely together, moisture is trapped, and thus they steam). Brown the meat well. When it releases easily from the bottom of the pot, turn the cubes and brown another side. Continue until browned well. Transfer to a plate and set aside. Repeat in batches with the remaining beef. When the beef is seared, remove any excess fat leaving 1-2 tablespoons in the bottom of the pot. Add the onions, carrots and celery to the pot. Stir with a wooden spoon and as the vegetables release their juices scrape up any brown bits left on the bottom of the pan. Season with a little salt and pepper. Add the garlic cloves and stir for 30 seconds. Add the tomato paste and let caramelize on the bottom of the pot. Stir to coat the vegetables. Add the meat back to the pot along with any juices that may have collected on the plate. Sprinkle flour over the meat and vegetables. Stir to coat well. Lower the heat to medium and cook the flour for about 2 minutes, stirring constantly. Add the wine to the pot and raise the heat to high. Stir well to release any flour or brown bits that may have accumulated on the bottom of the pot. This is where the flavor happens, so do your best to be thorough. Bring the wine to a boil then reduce to a simmer. Add water to just cover the top of the meat. Bring to a boil and immediately reduce to a simmer again. If any foam accumulates on the surface, remove with a spoon and discard. Add bay leaves, thyme, parsley, and peppercorns. 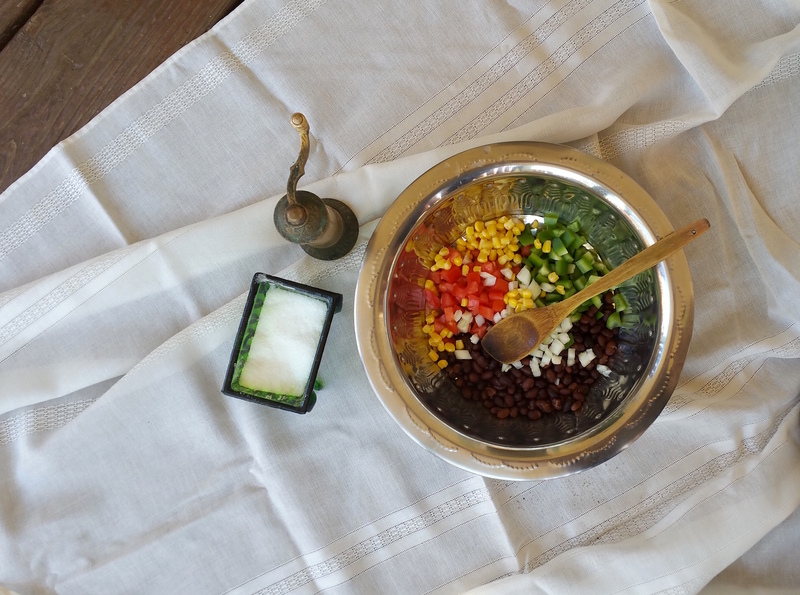 (Note, if you have cheesecloth and twine, wrap the bay leaves and peppercorns in the cheese cloth so they are easy to remove. If you don't, just do your best to pick them out later). Cook at a bare simmer on the stove top (or alternately in the oven at 325 degrees) for 1½ hours. After 1 hour, add the mushrooms, cubed squash if using and potatoes. Cook until the vegetables are tender and the meat mashes easily (and doesn't spring back) when smashed with a fork. Remove the parsley, thyme, bay leaves and any peppercorns you can fish out (or remove the cheesecloth packet if using). If the stew needs thickening, ladle ¼ cup of the sauce into a small bowl. Add the arrowroot and whisk with a fork to eliminate lumps and create a slurry. Gradually pour the slurry into the stew and whisk to incorporate. Bring just to a boil and allow to thicken. Season to taste with salt and pepper. Serve warm with crusty bread. If freezing, allow to cool to room temperature then transfer to refrigerator safe containers. Be sure to leave about 1 inch headroom on the top of the container to allow for expansion. 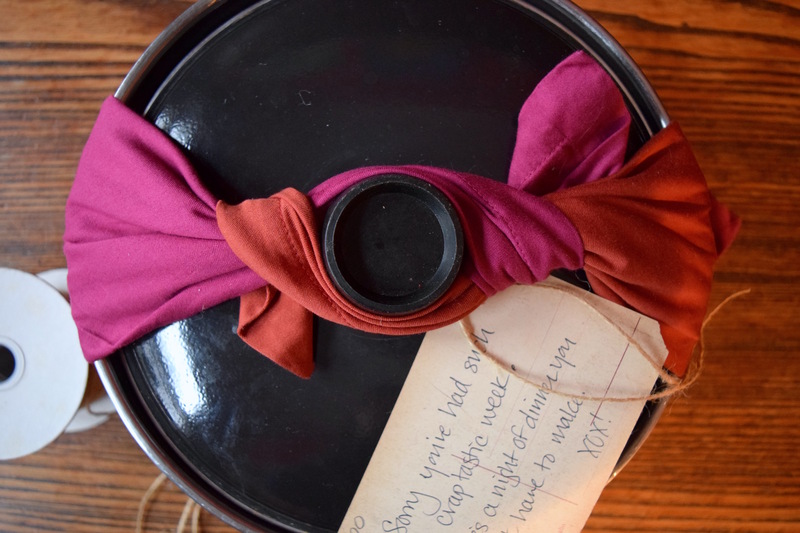 When it comes time to pack and wrap this pot of gorgeousness check out this post on just the topic. I’m a little obsessive about produce, so when meyer lemons appear on the shelves I throw a little party in my head. Their season is incredibly short which makes them all the more special. This year I was so happy to see them that I snapped up three huge packages – way too many. (I know – WTH? They’re not shoes that at least come in different colors.) I got home and placed them on the counter so I could admire them every time I walked by and soak up their fresh, hopeful scent. And then boom – I saw a soft spot. I was still in food-shopper-fetish mode and they were already starting to rot. I hadn’t even eaten any. Ugh. But like most things concerning food, the answer was simple. Preserve them. And move quickly before any of the others start to turn. I was desperate so I turned to alcohol (ha, ha) and it was surprisingly easy. I just sliced them up and covered them with vodka. That’s it. And just like that I had way too much meyer lemon vodka. Now, it really isn’t a problem to have so much of a good thing, but when I say a lot I mean A LOT. So I started sharing. 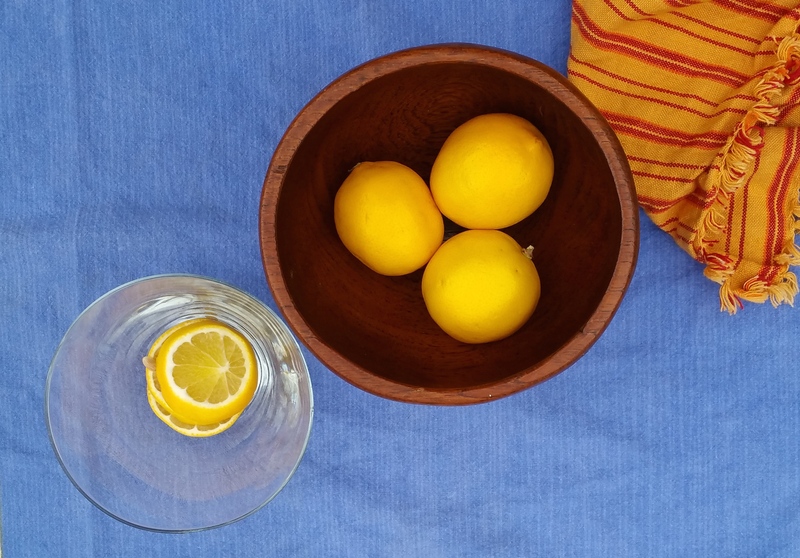 For a while, meyer lemon vodka was my go-to food gift. I brought some to a last-minute gathering of girlfriends who convened to parse an extra crappy day. (No, we didn’t do shots. We sipped. It was a Wednesday.) A few weeks later, the snow fell and fell and fell. After the neighbors boldy banded together to cross the street, we busted it out with some Aranciata. (We do not mess around when it comes to soda.) And just this weekend I found myself with no time (or butter) to bake for an early brunch so I brought some meyer lemon vodka instead. It was a 2 year-old’s birthday party with an army of toddlers in full swing stashing juice boxes and half-eaten bagels around the house. It was a much appreciated hostess gift. And then, just like that, my meyer lemon vodka was gone. While I was busy giving it all away, the meyer lemons had also disappeared from the store shelves. The season ended while I wasn’t looking. I’d have to wait another year. Then I realized that meyer lemons are just the beginning, a kind of mid-winter harbinger of all the amazing fruit about to come in season. I’m inspired to move on to strawberries, peaches, plums, fresh herbs, whatever. It’s just too easy to do. And there will always be an occasion that calls for the gift of home-flavored vodka. Because that’s just how life is – it happens. This recipe is really a guideline. If you want it to infuse faster up the amount of fruit. If you’re feeling creative try combining different fruits or add some dried spices or fresh herbs. Be inspired! Top with vodka. Tighten lid and place jar in a corner away from direct sunlight. Wait a day and start tasting. Flavor will deepen the longer it sits, but it’s pretty good after 24 hours if you’re in a rush. Strain into a nice jar and wrap it up. Cooking like crazy during the latest East Coast cold snap? Well you’re not alone from what we can see on Instagram. If you’ve made extra, it’s the perfect time to share. We’re always on the lookout for interesting, fabulous ways to package food gifts. We’re regulars at estate sales, thrift stores and church rummage events. 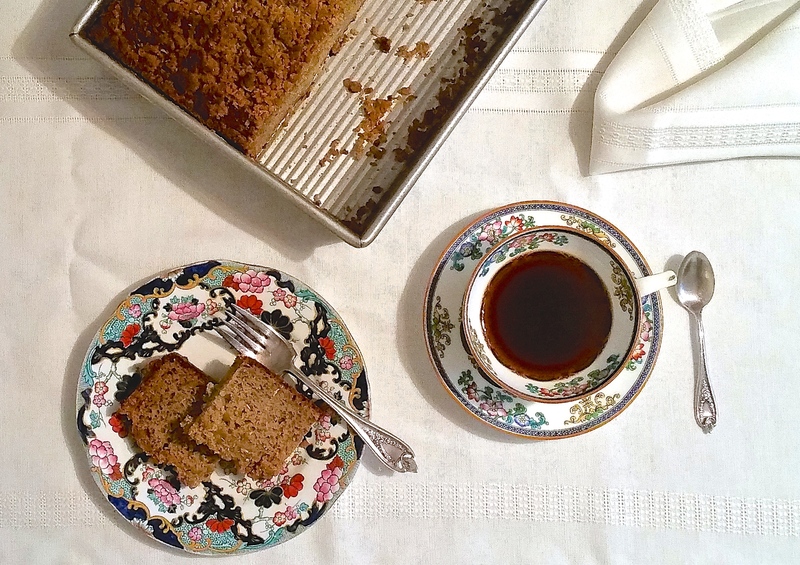 We naturally gravitate to the kitchen section, you never know what old tool, cake mold etc might be there (not to mention amazing flatware and glassware)…. 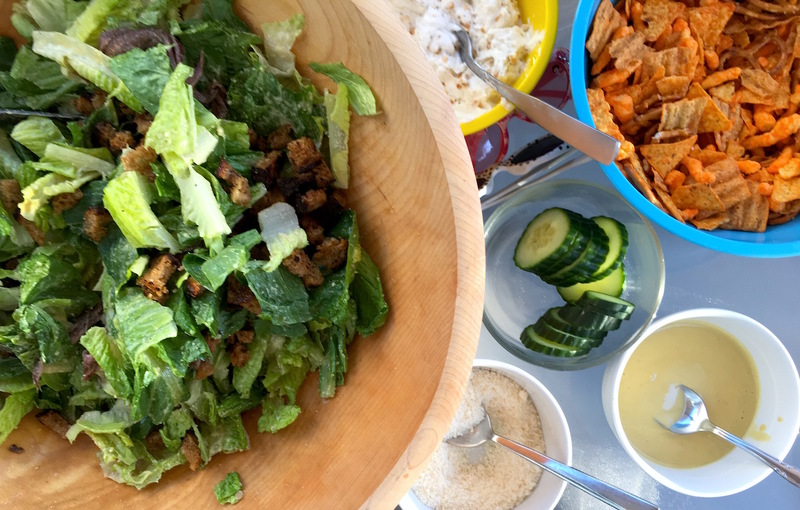 Potluck suppers or gatherings are a dynamic way to entertain, raise funds for a charity or just pull the block together. We get invited to a lot of them. They take the pressure and expense off of the host and get down to the heart of the matter of bringing people together to eat, socialize and meet, often for the first time. But as common as they are, what to bring is the usual looming question. 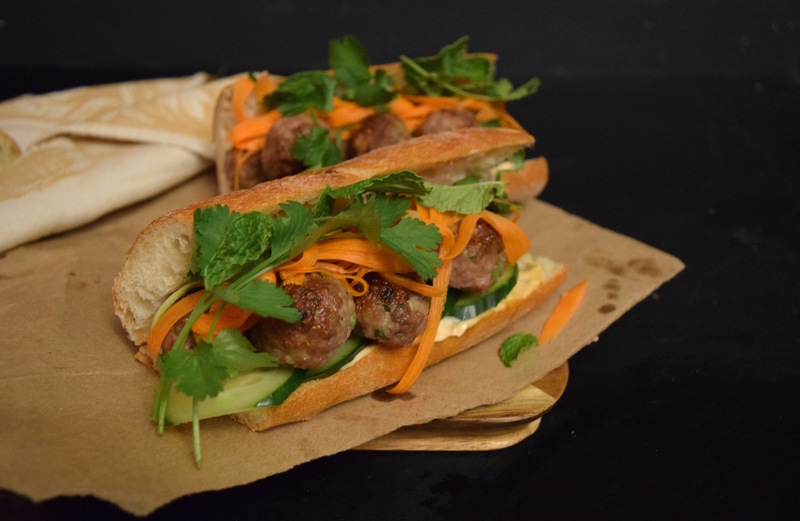 Well, we want to let you in on a potluck secret: mini meatballs…. I don’t care about football* but most of my friends do so I am all in for Super Bowl Sunday. Well, kind of. I care about the eating part of it. 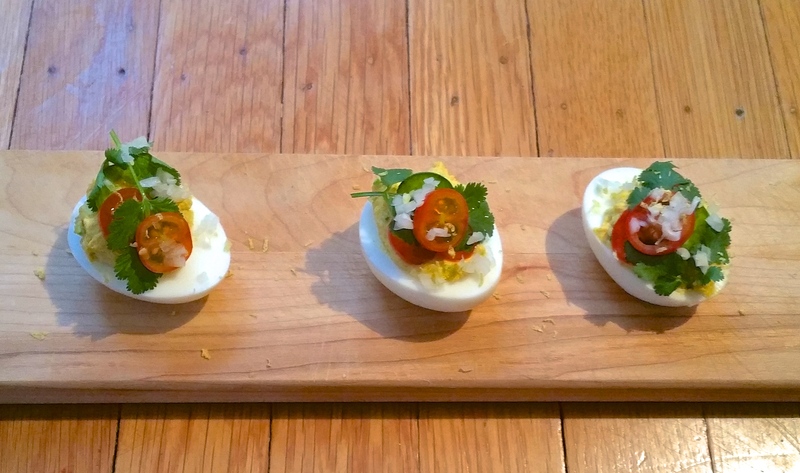 So to celebrate the fact that whatever team made it through whatever playoffs, I came up with some fun deviled eggs for my football-loving friends. Riffing on the picnic classic, I added Indian flavors and fresh veg. I’m hoping it will be interesting enough to spark a conversation about something besides the game, even if just for a few minutes. And if it doesn’t, it won’t really matter because we will still hang out after it’s over. Give and take, compromise and patience, these are the simple ingredients that make friendships last. And friends are what’s important no matter what happens on game day. * Opinions expressed here belong solely to Stacy and do not reflect those of Krista or anyone related to, or on current speaking terms with, Stacy….